Vélo Vogue: Bay Area Bike Share is HERE! Check out these cool events and celebrate bike share finally coming to the Bay! 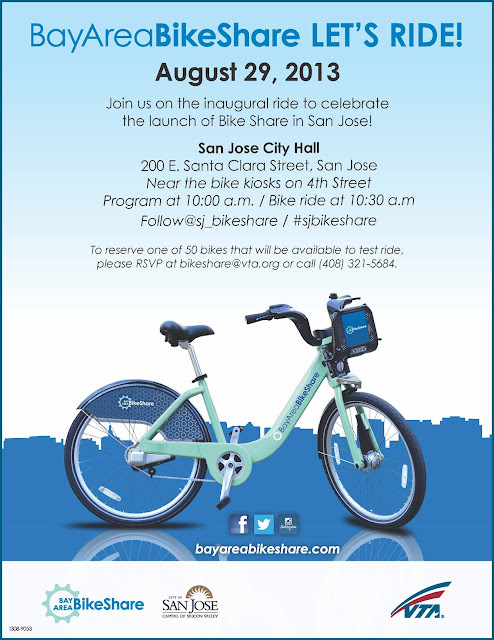 • San Francisco launch event takes place 10:30 AM at the 4th & King Caltrain bike share station. • San Jose launch event takes place at 10 AM at San Jose City Hall near the bike kiosks on 4th Street. • Mountain View launch event is in front of City Hall at 10 AM. • Palo Alto event launch event is at the bike share station at University/Emerson at 10 AM. San Jose peeps can reserve one of 50 bikes to test ride. Follow @sj_bikeshare and start sharing!